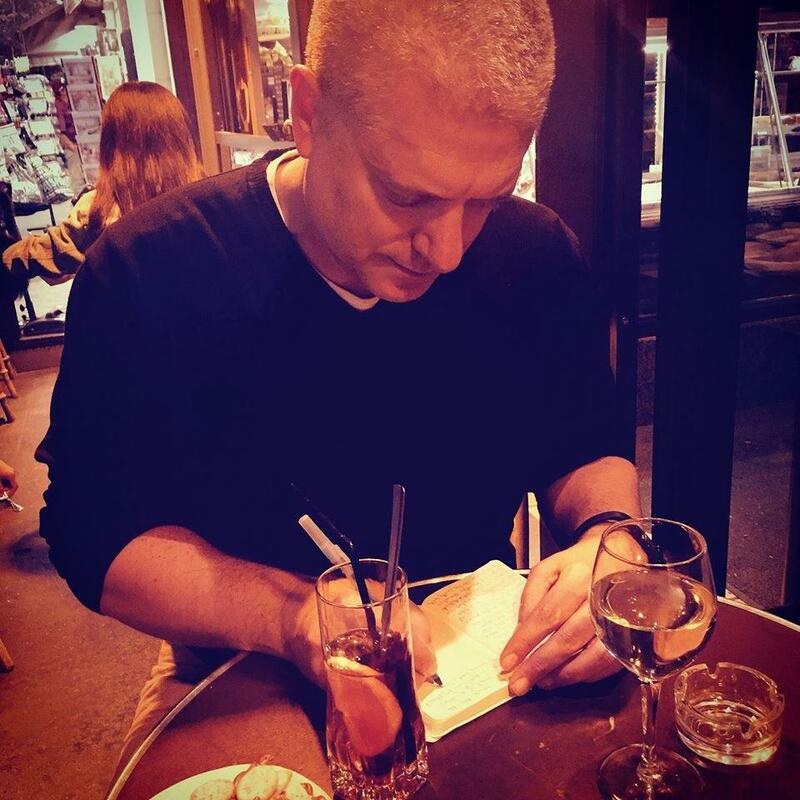 Mark Pryor in a Parisian café, working on the sixth book in his Hugo Marston series. JH: You grew up in England, you studied journalism and law in North Carolina, and you now live in Austin, Texas. What made you want to write a series of books based in Paris? MP: I love the city – I just got back from a research trip (yes, I know, it’s a hard life!). It’s so visually beautiful, so easy to walk. (I measured: my wife and I covered 50 miles there last week). I love the café culture there, too, the people watching. The more practical truth is that I set The Bookseller, my first novel, in Paris because it was while walking alongside the Seine that I had the idea for the book. Maybe if I’d been in Rome or Johannesburg, the series would be set there. I’m very happy about this, of course: see aforementioned research trip! JH: You have a pretty interesting “day job.” What was the path that led you toward becoming a prosecutor? And when did you first know you wanted to be a writer? Do the two have anything to do with each other, or are they just two very different parts of one very interesting life? In truth, I was sort of fishing around for a career a little later than most (in my late 20s) and looking to get out of journalism, and had always been interested in things criminal (err, not in that way). I decided to go to law school when I was living in North Carolina, with an eye towards joining the FBI. That didn’t happen, quite the opposite: I found myself working for a fancy law firm in Dallas, and after three years realized I was hating it, wasting my time. I wanted to feel like I was doing something worthwhile, I wanted to be in front of a jury with the drama that entails. So I applied to the DA’s office and landed a job here in Austin. As for the writing, that’s always been in my blood. I decided to take it seriously, though, about ten years ago. It’s a tough thing, getting published, but I felt like I needed to give it my all. After three novels that went nowhere, and several hundred rejections from agents, I finally got lucky! There is a connection between the two things, I think: my interest in crime and police investigations. I remember reading Helter Skelter [about the Charles Manson case] and being fascinated by the personalities involved, the good guys and the bad guys, how the police and prosecution pieced together what had happened and made a case in court. Hardly surprising that I now write crime novels. Maybe it’s to further my quest to understand both mindsets. JH: Can we talk about Hugo Marston, the ex-FBI, now-US Embassy-head-of-security protagonist of your Paris mystery series? To me Hugo is a very sympathetic character: he’s smart, brave, fundamentally decent, and yet he’s been, unfortunately– endearingly, somehow–unlucky at love (like so many of us)…How did you think him up? MP: Good question. I didn’t build him in some Frankensteinian way, but he’s definitely a more organic assortment of people I’ve known. The strongest influence on Hugo is my father, from where Hugo gets his basic decency and his slightly reserved nature. I’ve also sprinkled in there the cowboy idea, not the gun-slinger but the steely-eyed sheriff who watches over his town in a calm, measured, and intelligent way. What could be better, a cowboy in Paris?! JH: It’s interesting that part of the plot of “The Bookseller” has its roots in WW II, in the still-festering wounds of the “civil” part of that war, in particular in the still-festering wounds caused by anti-Semitism and those who collaborated with the Nazis during the Occupation. I’ve seen this theme come up more than once in mysteries set in France. Do you have any thoughts about why that may be? MP: One of the themes that runs through my books is the idea that you can never escape history, either your own personal history or the broader history of the place where you live. So, in The Bookseller I have a little of both. And the truth is, even today the shadow of World War II hangs over much of Europe, there is a sense of unfinished business in some ways. I just finished reading Bruno, Chief of Police by Martin Walker, a super book, and he takes on some similar ideas. Bottom line, those unresolved conflicts, the secrets that come out of any war, make great motivations for characters, make great subplots for crime writers. JH: Who are your literary mentors? And what do you like to read just for fun? MP: From my early years I’d point to Agatha Christie and Sir Arthur Conan Doyle, for their genius plotting and my first real encounters with brilliant detectives. I see Hugo in that vein, not a hero who relies on shooting and fighting and chasing, but a man who uses his head to solve crimes and catch bad guys. More recently, I’ve paid attention to the way writers put words on the page, and I’m a huge fan of Alan Furst for the way he creates atmosphere, and Tana French for the literary quality of her books. 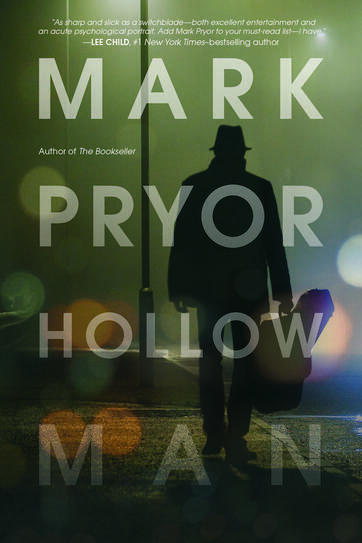 JH: Do you want to tell us something about your new book, “Hollow Man,” which is being published this month? MP: For me, it’s something of a departure. It’s about Dominic, who is a prosecutor, a musician, and an Englishman living in Texas. He’s also a psychopath. His main goal is to hide his condition and lead a seemingly normal life while he pays off his debts and tries to make enough money to become a full-time musician. But he falls under the spell of a beautiful woman who convinces him to commit a crime that goes badly, and results in a murder. It’s still crime fiction, but rather than a traditional mystery it’s a real psychological thriller, a look into the mind of a very disturbed (but seemingly functional) person. I loved writing it, and so far the reviews have been great, so I’m hoping I can please a few readers with it. JH: What comes after the launch of “Hollow Man”? Is there another book in the works? Do we get to follow Hugo on another adventure? MP: Yes, right now I’m working on Hugo #6. It’ll be set back in Paris, about a murder, maybe even two murders, that takes place at the American Library, right close to the Eiffel Tower. I think the projected release date is June of next year, so I’d better get on with it! JH: What do you love most about Paris? About England? About Texas? MP: I just made my 14th trip to Paris, and I could go back tomorrow. I’ve mentioned a few things I love about it, but the main thing for me is the fact it’s such a visually beautiful city. Many major cities have beautiful old buildings, but in my view these days they are often marred by more modern construction which dilutes the sense of history that hits you so fully in Paris. From the winding streets of Montmartre, to the wider boulevards in the 7th arrondissement, there’s so much to see. And the food… I had the second best meal of my life last week. The best was on my honeymoon, also in France. I don’t say much about England because I don’t feel like I know it any more – it’s been 15 years since I was there. Isn’t that something? Ever since my parents moved to a beautiful house in the Pyrenees mountains, that’s been my place to visit. And of course Texas is so very different from both places. Austin, where I live, is my family’s kind of town, though: music, art, books, great food… and super-friendly people. I’m not wild about the July-September heat, but the rest of the year it’s a super place to live and raise a family. JH: Do you have any words of advice for young (or even not-so-young) would-be writers? MP: The first thing I tell people is to learn the craft of writing. It’s not rocket science, but it’s not a skill most people are born with, it requires a certain degree of study, of application. I’m reworking one of my early novels and when I see how far I’ve come, I didn’t realize how… well, how not great my writing was a few years ago. The next thing is: don’t quit. I wrote three books before I wrote the one that got published. I queried hundreds of agents and almost every single one of them either turned me down flat or ignored my queries. My wife questioned my sanity a few times, subjecting myself to all the rejections, but I kept plugging along. And you know what? It’s worth it. It’s worth the writing, the rewriting, the “not for me” emails from agents. You’ll get some of those from publishers even when you’re represented. But seeing your books on the shelf at your local bookstore makes it all worthwhile. So my main advice is: don’t give up! Entry filed under: About Writers and their Work. 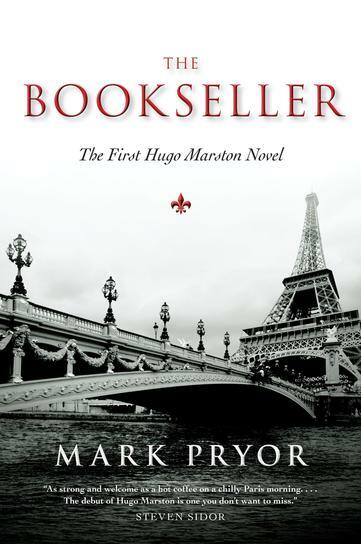 Tags: books set in Paris, Hugo Marston, Mark Pryor, mysteries, mysteries set in Paris.